Tesla has not only stolen key talent (and some say design cues) from Aston Martin, but is also talking with Google about making an electric robot car. In typical Silicon Valley fashion, bridges are being jumped at Tesla Motors. Tesla Motors is nothing if it's not controversial. The company has made headlines for extreme engineering, cutting-edge design, far-fetched statements, inflammatory retaliatory statements, and more. Typical of the Silicon Valley culture, Tesla is more e-business than automotive in its attitude. 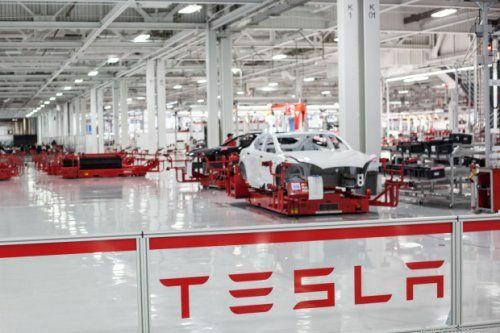 Since the announcement of the Model S and Tesla's plans to build it entirely in-house, the company has been grabbing talent from traditional automakers to bolster its own knowledge base and credibility as a maker of cars. Their latest acquisition comes from Aston Martin, a company whose storied automotive designs have made legends. Some have said that the Model S itself, in aesthetics, was heavily influenced by Aston Martin. That may or may not be so, but the engineering behind the next model, currently called the Model X, may well be. Chris Porritt, Aston Martin's Chief Engineer of Vehicle Engineering, has jumped ship and crossed the pond to work with Tesla instead. He will become TM's Vice President of Vehicle Engineering. Porritt is best known for his work on the Aston Martin One-77, which uses an advanced structural design and active suspension to mark its place as one of the greatest supercars of the current era. In fact, most of the recent Aston Martin innovations in platform design are thanks to Porritt, whose work underlies the DB9 and Vantage models. Before his time at AM, Porritt was with Land Rover, where he went from college intern to principle engineer in vehicle dynamics. That's not all that Tesla is doing either. A new Bloomberg report says that Tesla is also talking with Google about integrating the search giant's driverless technology into its electric cars. Tesla's CEO, Elon Musk, prefers to say "autopilot" when referring to this technology. He says the term "self-driving" sounds too much like it will be doing stuff you don't want it to do. Some of us might be envisioning a crashing car filling with foam and Stallone digging himself out of the wreckage. Would this be something you'll see in the Model X? Probably not. At least, not right away. Google says the technology won't be ready for market for another five years and it's not likely that automakers, even envelope-pushers like Tesla, would adopt it right away. Even if they did, the slow hand of government would not be quick to give the thumbs up and insurance companies are going to be naturally leery of the idea as well. Still, if you can imagine the next Transformer bearing a Tesla badge.. why not?